It’s not wise to underestimate the Tom Brady-less Patriots, as seen the first two weeks. Next up at quarterback for the New England Patriots might be Steve Grogan, after Jimmy Garoppolo was knocked out by a shoulder injury last week. 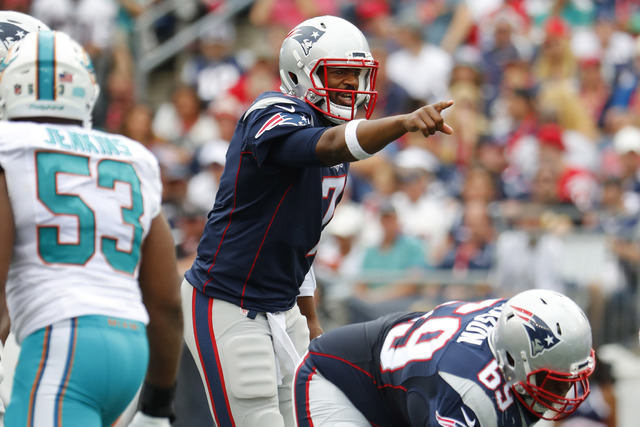 Jacoby Brissett, a rookie from North Carolina State, will start Thursday night against the Houston Texans. Brissett was serviceable a week ago and in the preseason. At most Las Vegas sports books, New England has moved from a 1-point underdog to a 1-point favorite. The total is 40, with the expectation the defenses will control the game. There are plenty of Bill Belichick connections — including coach Bill O’Brien — on the Houston side. But the Texans offense still appears to be a work in progress as Brock Osweiler and other new weapons are taking their time getting in rhythm in the O’Brien scheme. Houston has relied on defense for its 2-0 start, but that recipe might not be enough against Belichick. Las Vegas handicapper Bruce Marshall is editor of The Gold Sheet (Goldsheet.com).